Business offices that still require suits are invariably dominated by two basic colors: charcoal gray and navy blue. Charcoal gray is the more popular of the two thanks to its offering the same high dress standard with somewhat less color-matching challenges; however both remain enduring classics of men’s style and if a man only own two suits he should have one at least be navy blue. Navy blue offers unique advantages that earn it a place in most discerning suit-wearers’ closets. Most strikingly, navy is a “young” color, lending an impression of youthfulness to the wearer that older men may find very flattering (though extremely young or baby-faced men may find the effect too youthful for their tastes). First-time suit buyers and veteran dressers alike will want to keep the benefits of the navy color in mind as they build their wardrobes. It’s important to distinguish navy from other blues: a true navy blue suit is a deep, almost midnight color, not just any dark blue. The latter can make striking suits for more casual occasions, but lack the universal acceptance of navy. Navy blue, on the other hand, can go anywhere. It serves up to “black tie optional” levels of formality when worn with a white shirt and conservative tie. Worn more casually, particularly if the jacket is worn separately with lighter slacks, a navy suit becomes a piece of social wear suitable for any relaxed occasion. 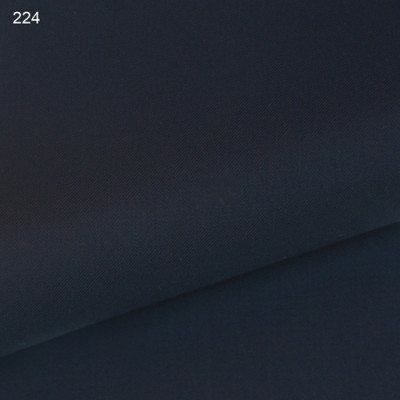 Note the color midnight navy is its own shade of navy blue, and is best reserved for a unique and classic take on black tie formalwear. A patterned suit is always less formal than a plain one; thus a navy pinstripe is an option for a businessman who is going to own more than few suits and want to signal he is ready to make a deal. 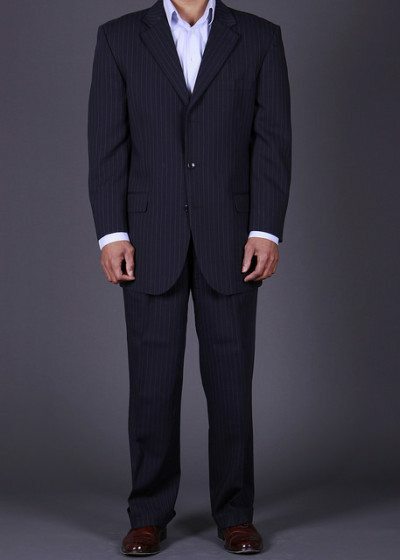 Pinstripes are the most common modification in navy suits, and they are acceptable business wear when done modestly. An unbroken solid navy however will be more versatile, so if you’re going to own one suit and it will be navy blue select a solid that can be used for solemn occasions or the most formal of business dealings. Navy is a deep, rich color, that looks best in 100% virgin wool fabric. It does well in thick weaves without excess sheen. Too much smoothness to a weave can create a glossy, slick appearance that looks unnatural to the eye. Thick wool fabrics make excellent navy suits with a matte finish that shows the color off to its advantage. A lighter wool can keep the garment comfortable in warmer weather and still lends the natural drape of wool, which keeps the fabric even and close to the wearer’s body. Exotic blends to include cashmere and mohair are desireable if one seeks extra softness and perhaps a lighter weight with similiar properties to wool. Small percentages of artificial fiber in the weave are acceptable (US law allows a 3% variance – so what is declared 100% wool may actually be 97%), and even desirable in small quantities for strength and stretch resistance. More than trace however points to cost-saving rather than well-thought construction and fabrics with more than 30% synthetic fiber should be avoided if you can afford it. Too much synthetic fiber in the weave creates a flat, plastic-like sheen that makes a suit look cheap and will cut its life significantly. Fit matters in every suit, and most of all in a dark suit. A dark suit emphasizes the shape and presence of the wearer more than a lighter color would. Excess fabric can make a man look slumped and saggy, while fabric that clings or pinches too tightly makes him look awkwardly oversized and straining at the seams. A fit that stays close to the body without pinching while moving is ideal for a dark suit like navy blue. The shoulders and sides of the jacket and the “rise” of the trousers — the distance between the waistband and the crotch — are the key areas to check in suitfit. Excess fabric in any of them will look obviously saggy to viewers, and tightness will be exceedingly uncomfortable as well as unattractive. Men buying off-the-rack should also pay attention to collar size, which tends to be unnecessarily loose on many mass-produced jackets and will most likely need to be adjusted. 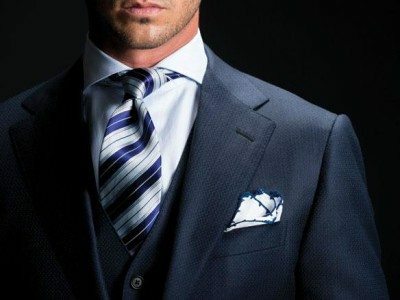 The cut and details of a man’s suit depends largely on its intended purpose. A man who wears suits infrequently and needs a single, multipurpose garment for all dress occasions will want to err on the side of the universally acceptable: a single-breasted, two- or three-button jacket in plain navy is the ideal arrangement. 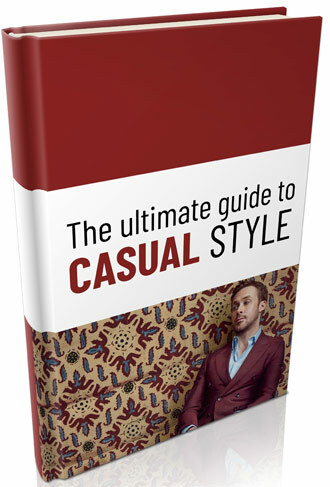 Businessmen who wear suits daily may want a touch more variety in their wardrobes. Peaked lapels add an unusual flair to an otherwise traditional jacket, and venting — short slits up the back of the jacket — can help it drape more neatly as the wearer moves. 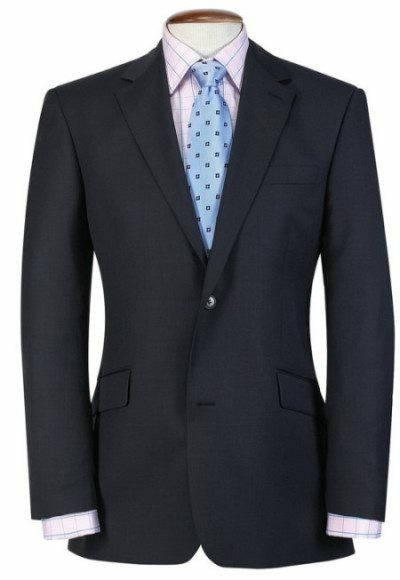 A double-breasted jacket or accompanying waistcoat offer more extreme variation, and give an extremely elegant and formal look to a navy suit. Dark trousers should ideally sit high on the waist and drape over the front of man’s stomach rather than hugging his hips below it. Suspenders may help with this, providing fixed points for the pants to fall cleanly from rather than a tight belt pinching loose fabric into place. Pleated fronts offer additional room for men with a broader midsection, while slimmer gentlemen can wear a plain-fronted trouser for a more streamlined visual appeal. Part of a charcoal gray suit‘s enduring popularity stems from the ease of matching other clothing; navy blue requires a touch more thought for a balanced look. Blue does best contrasted with “warmer” colors — its natural opposites on the color wheel — than it does with close neighbors like purple and green. Very light shades of these similar colors can still stand out against the darkness of navy green, and patterns will help moderate the effect further, but men will want to be cautious of mixing their blue suit with anything too closely related. Plain white is, of course, always an option, and the most formal one available. If a navy suit is worn unpatterned it can serve admirably well with suits and ties of most patterns. A pinstriped suit is more limited, and should only be worn with clothing in patterns of a different scale. Wide pinstripes will probably look fine with a very closely-gridded dress shirt, for example, but would look awkward over another set of broad stripes. Navy blue’s position in menswear is well-assured. It shares the highest dress standard outside of formalwear with charcoal gray. Many men prefer gray for its ease of matching, but navy offers a slightly more eye-catching touch of color and a distinctly youthful flavor that flatters older men. A navy suit can serve as a regular piece of clothing for a frequent suit-wearer or as the single go-to option for a man who rarely needs a full suit. We recommend a navy suit — or several — for any man’s wardrobe.